There’s something a little unhinged about Nicholas Connors. The way he stalks the stage with that melting gleam, slinging his axe all manic and moody, brimming with cheek and charm. When that deep resonant tone bellows forth, crooning its perverse ruminations on romance, you might think there’s a demon of mischief dwelling somewhere in the smoky apartment of Connors’ mind, drunk on Tennessee whiskey, tapping its cloven feet to Cave, Cash and The Cramps. It’s little wonder that Connors, with his commanding presence, has been paired in the live arena with William Crighton, Cash Savage and Papa Pilko & The Binrats, and been invited into discerning halls like The Gum Ball, Dashville Skyline, Narara Festival and Dog Days. 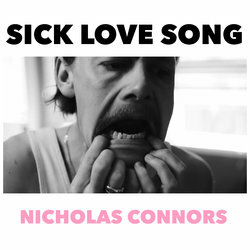 Connors is set to continue his ragged rock ‘n’ roll odyssey with debut record Sick Love Songs, a collection of strange and savage encounters in the life of a young man on the prowl, down on his luck and looking for love in the wrong corners of a blue-collar town. First taste is ‘Sick Love Song’, a red-hot rocker that demonstrates Connors’ proclivity for melody and swaggering carnal energy. Sick Love Song describes several encounters in a young person's explorative love life and the cry for deeper connection, while riding on the back of a ragged rock and roll road hymn.